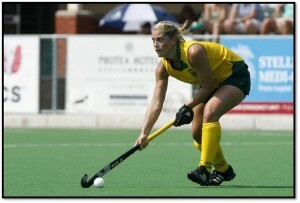 Kate Woods has played somewhere near 170 times for South Africa in Womens Field Hockey netting on 33 occassions. Her CV is one that many wish they could have a small part of and include 3 Olympic Games, being voted national player of the year in 2008 as well as participating at the Commonwealth Games. Kate has now hung up her boots and stick and will spend her time devoted to her work with Adidas and her family with husband Duncan and son Sammy. We sat and had a chat with the defensive stalwart for South Africa. All Things Jabu (ATJ): Hi Kate, thank you for the chance to chat! How are you feeling about your Olympic experience? Kate Woods (KW): I have many mixed emotions still! I feel really privileged to have experienced one of the best Olympic Games, I thought London put on the most incredible show but then I also feel slightly disappointed that we did not finish higher and play to our full potential. ATJ: Having competed at the 2004, 2008 and 2012 Olympic Games for South Africa, which did you think was the best to be part of and why? KW: It’s hard to answer that because each was a very different experience for me. I think London got it spot on though in terms of the whole package. The village was awesome, nice and compact and central to all stadiums. 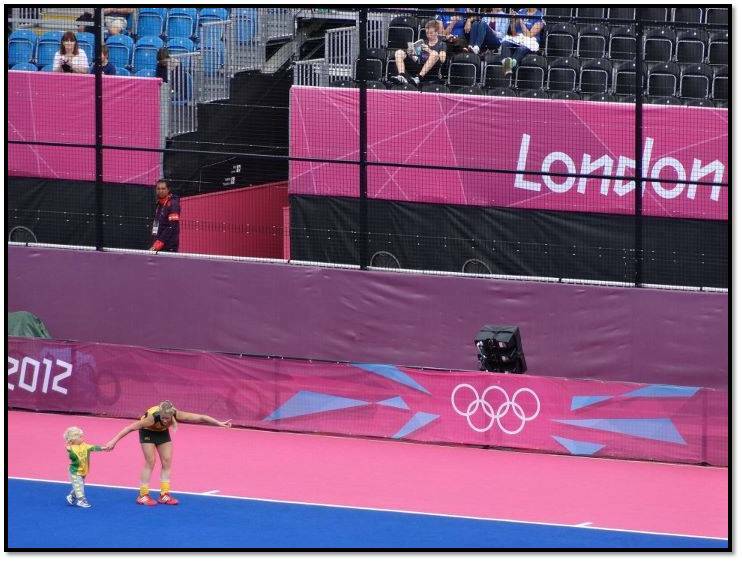 The fact that all the Stadiums were situated together and the whole Olympic Park concept was truly fantastic – it meant those that didn’t have Olympic tickets could still be a part of the action within the park and this created such an awesome atmosphere and vibe. The stadiums were very cleverly constructed, although most will be dissembled after the Games, they were built brilliantly that there was hardly a bad seat in the stadium. It was so well organized and ran so smoothly and the volunteers were extremely happy to help and cheerful. Lastly, the fact that ‘sustainability’ was such a major focus for the London Games was for me also so well thought out and put together. 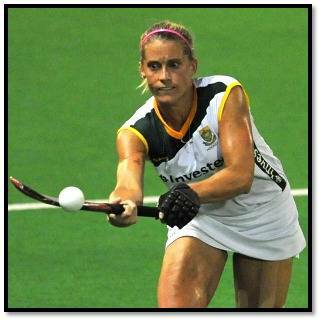 ATJ: You have now retired from international hockey after more than 150 games for South Africa, are there any games that stick out in your memory? ATJ: Is there any way we can get you to reconsider your retirement? KW: Haha – must say that thought has crossed my mind. It’s so hard to stop something that you love doing. Unfortunately though, it is just too tough to manage 3 very big commitments at once. If hockey were a professional sport in our country I’m sure I could answer this question differently but for me now family and work are my top priorities. I am sad but the time is right for me to step down completely. I would like to extend my little family as well in the not too distant future. ATJ: Your husband is an ex national Water Polo player, you are now an ex national hockey player, which of the sports would you like to see Sammy go into? KW: I say tennis! No, we do joke around about it at home but really we are not phased or pushing in any direction. Right now, Sammy has golf clubs, a tennis and squash racket, a hockey stick, a polo ball (and speedo!!) and soccer balls. He is mad about sport already at 2! Duncan’s only wish is that Sammy chooses a team sport as we have both had so many amazing memories from our tours. ATJ: Having taken time away from the game for the birth of Sammy, what was the toughest challenge you faced in returning to the game? KW: For me getting my fitness back was priority – this wasn’t a huge challenge though. It meant a lot of training but I had a fantastic trainer who helped me achieve this. International match intensity was a bit of a shock to the system when I first came back, nothing quite prepares you for this. I think the biggest challenge for me though was that I did not have enough time on my hands to do more pitch time. I did not have the luxury of going down to the pitch in my own time to work on my individual skills. ATJ: You have faced a host of top quality opposition over the years, who is the toughest opponent you have faced in hockey? KW: I would say the Dutch are the toughest. They are the most consistently strong, skilful and well drilled hockey team I have played against over the last 10 years. ATJ: We have had you, Marcia and Pietie around for a while now, but who do you think is the best placed of our young players to make a name on the international scene? 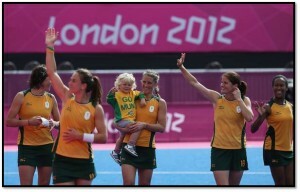 KW: I think there is a bright future ahead for players like Ilse Davids, Bernadette Coston and Jade Mayne. 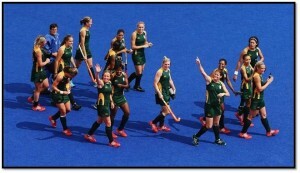 ATJ: How has Giles Bonnet changed the South African Ladies team and approach? KW: He has brought professionalism to the sport. A lot of girls have now got the opportunity to play professionally in Europe. It also means that a large squad can train together once or twice a week in a centralized venue (this was never possible in SA) Giles has almost doubled the amount of test matches that we play in a year now so the experience we are gaining is enormous. Giles has a long term plan for the team – to reach top 6 by 2014 World Cup. This may be a bit too far out of reach but we have the potential!! ATJ: So where to from here for you Kate? 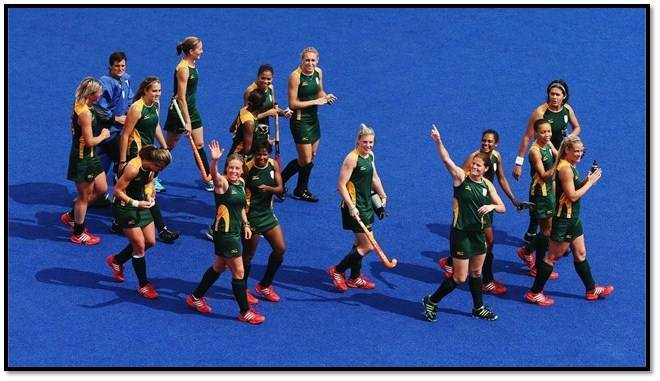 ATJ: What do you think South African hockey needs to do to help us move up into the top 8 at Rio? KW: We need the support of fantastic sponsors like Investec to stay on board and back the team. This is to enable us to compete in the amount of tests and tournaments that Giles has planned for the team. Unfortunately we need to encourage players to play in overseas leagues as our Provincial league’s at home can’t match this level at the moment. (That is something that needs to change in the long term). We need to continuously play under high pressure situations. We need to practice winning! ATJ: Where can our readers find out more about you? ATJ: Thanks so much Kate! We wish you all the best and thank you for the awesome memories!